Looks like an egg, smells like an egg, cracks like an egg, must be an ... olive? The marketing suits who gave the latest DAP/speaker combo from Sofmap the name ' DigitalOlive ' presumably wanted to drive customers away with their wackiness. It's a shame, as it looks to be a capable little product. 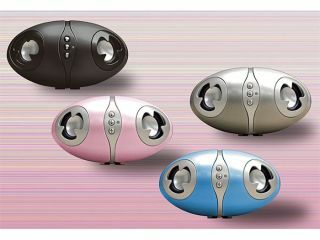 For just ¥5,980 (£24), shoppers who can see past the daft name get an unusual 275g egg-shaped combination of two speakers and a memory-free audio player. Music - both WMA and MP3 are supported - can be piped in on SD/MMC card, via any USB memory drive or direct from an external source such as a CD player. After setting up the audio feed, it's a simple matter of reassembling the egg and letting the combined 3W of aural pleasure wash over you. Power is courtesy of four AAA batteries or the supplied AC adapter. But why, oh why did you go with 'olive' guys - what was wrong with 'Audio Oeuf'?